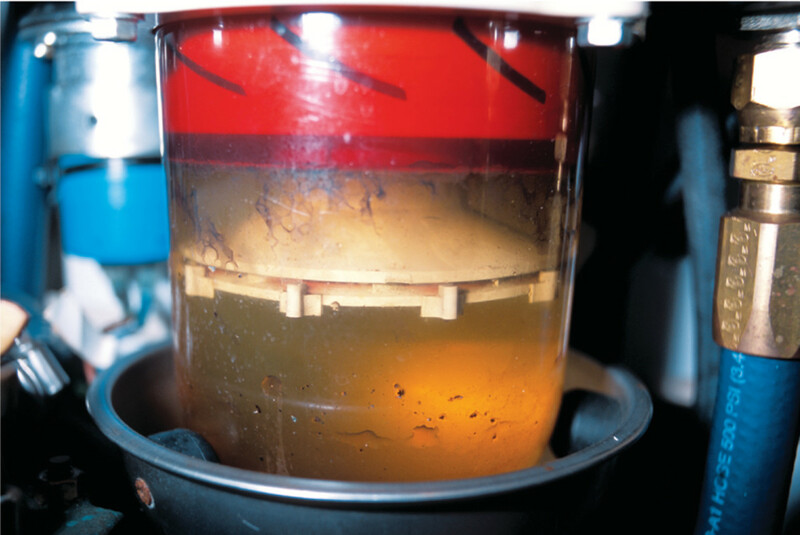 When it comes to cleaning diesel fuel before it’s burned by your boat’s engine or generator, the conventional approach calls for passing it through various forms of pleated cellulose or combination synthetic elements, as well as a gravity-type water separator. While the concept of this type of filtration has been around for more than half a century, the science behind it has been elevated to lofty heights. Most manufacturers of these filtration products claim 99 percent or greater efficiency at removing solids, water, and many other contaminants. Where fuel filtering is concerned, is this as good as it gets? In many respects, the answer for the time being is yes, particularly with regard to primary fuel filtration. In spite of the fact that there are decided differences from brand to brand and from model to model, replaceable pleated elements and water separating bowls nearly always do an excellent job of keeping dirt and water on the right side of the filter media. to behave erratically or shut down entirely. But, let’s be clear: this isn’t the filter’s “fault.” When filters get clogged, they are performing exactly as they are designed to perform. I’ve heard vessel owners complain that a particular filter is “inconvenient” or “doesn’t work” because it clogs too frequently. This is pure folly. When a filter clogs, it’s worthy of praise, not condemnation. 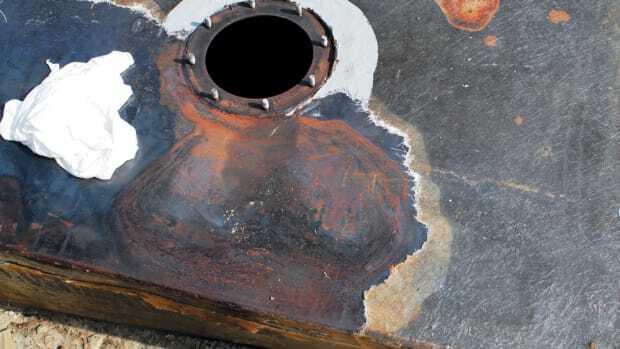 For many cruisers, polishing systems, which we’ve discussed in quite a few articles and columns in PMM, have become the first line of defense against primary and secondary filter fouling and myriad related problems. If the fuel in your boat’s tank is kept as clean as possible, it only stands to reason that the likelihood of your engine’s filters becoming fouled will be substantially reduced, if not eliminated. 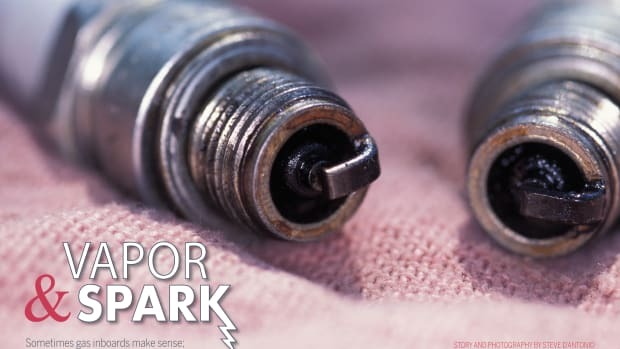 Although far from inexpensive, the polishing system approach is one that has proven a worthwhile investment for many boat owners, minimizing engine and fuel tank woes and the expense, anxiety, and hassle that accompany them. As mentioned earlier, it’s natural to wonder whether there is any form of filtration that’s better than the tried-and-true, high-quality pleated element and water separator. Where polishing systems are concerned, the answer to this question is a qualified yes, and it comes in the form of a centrifuge. While he’s not the inventor of the modern separating centrifuge, Swedish engineer and chemist Carl Gustaf de Laval is acknowledged by many as being the father of it. An accomplished inventor in his own right, de Laval worked with steam turbines, among other things, toward the latter part of the 19th century, building high-speed units that utilized special nozzles of his own design. These “de Laval nozzles” required reduction gears, which in turn needed copious amounts of lubrication. (De Laval’s designs are still used today in rocket nozzles and reduction gears.) In the process, one of the challenges he faced involved the contamination of turbine oil with steam, and thus water. In searching for a reliable, inexpensive method of quickly removing water and other contaminants from oil, de Laval turned to the centrifuge separator, a product he had already improved and developed successfully for other applications. Interestingly, while de Laval’s work with turbines and gear reduction was having an impact on the engineering and maritime worlds, the first steam turbine “yacht,” Turbinia, was being sea-trialed. (Turbinia, in 1894 the fastest vessel on the planet, can be seen today at the Discovery Museum in Great Britain, a perfect gearhead field trip if ever there was one!) De Laval’s improvements to the centrifuge were used for more humble pursuits. In 1878, he patented the first continuous centrifugal milk-cream separator (previous patented designs could not work continuously). The de Laval dairy separator went on to become an immensely successful product, along with the Swedish inventor’s vacuum milking machine, both of which were manufactured under license all over the world. The first commercial use of the separator other than for dairy purposes was for the processing of fish oil in 1882. A centrifuge works like an amplifier for gravity. If you thoroughly mixed oil and water by placing them in a blender, the emulsion would remain mixed for days or even weeks. Eventually, however, because of their differing densities, the oil and water would separate, although perhaps not completely. In many cases, a permanent emulsion layer would remain, particularly for liquids such as fuel or lubricating oil and water or coolant. By rapidly spinning this emulsion in a centrifuge, the comparatively weak force of gravity that normally acts upon these substances is multiplied several thousand times. It’s not unusual for a centrifuge to impart 6,000 times the force of gravity (6,000 gs) on the liquid contained within while spinning at 7000—9000 rpm. By comparison, you might pull 2 or 3 gs when braking or cornering rapidly in a car or falling off a large wave while under way. Through this enhanced gravitational force, even the smallest particles are slung out of a liquid. Centrifuge manufacturers routinely guarantee removal of particles as small as 5 microns from diesel fuel and light lube oils, while practical applications suggest that particles as minute as 0.5 microns can easily be removed by a centrifuge’s high-speed rotation. A centrifuge not only is capable of separating solids from liquids but also efficiently and nearly completely separates liquids of differing densities, such as fuel and water. In many designs, the water is bled off continuously and automatically without requiring any action on the part of the operator. The rotational energy for nearly all centrifugal fuel separators is derived from an AC or DC electric motor. (“Separator” seems a more appropriate term than “filter,” because these centrifuges lack filter elements.) The motor may also operate, by means of a gearbox, a feed/discharge pump that moves fuel into and out of the centrifuge. Many centrifugal separators, including those made by Alfa Laval, a leading manufacturer, establish a “water seal” within the device by adding a small quantity of water prior to beginning operation. As a result of a clever internal design feature that takes advantage of the fact that water has a greater density than fuel, the water creates a dam of sorts that prevents fuel from draining from the separator while it’s rotating but allows water separated from the fuel to drain freely from the unit. The average centrifuge used aboard a moderately sized vessel is roughly the size of a small air conditioning compressor pallet and weighs between 80 and 150 lb. It’s capable of pumping between 150 and 200gph. One popular model manufactured by Alfa Laval, the MIB 303, lies at the larger end of these ranges and uses between 450 and 700 watts at 24VDC, 120VAC, or 230VAC. Like most centrifugal separators, it is a hands-off unit; after adding water, you start it and walk away. Water drains automatically, and the bowl, which holds about a measured cup of compressed “solids,” needs to be cleaned only when it’s full. There’s one important distinction that must be made at this stage of our discussion about centrifugal separators. Many conventional primary fuel filter designs utilize what their manufacturers refer to as a “cyclone,” “turbine,” and/or “centrifuge” component that’s designed to “spin off large particulates and water droplets.” Wait a minute, you might say. If I already have a centrifuge in my primary fuel filter, why would I consider installing a 150-lb. version that no doubt costs a lot more? Let me state emphatically that the centrifuges in many primary filters, including those from Racor, Separ, Baldwin, and others, are not a gimmick. As stated, they are effective at spinning out large particulate debris and water droplets. The speed at which fuel moves and spins through such passive centrifuges, however, imparts just a tiny fraction of the g-force that’s present in a dedicated, active centrifugal separator. While these passive centrifuges are effective and desirable components in the primary filter arrangement, they simply are not capable of removing dirt, debris, and water in its molecular or single-digit micron form, nor are they designed to. Thus, in spite of the fact that the word “centrifuge” is used to describe one of the steps these filters use for water and debris removal, there’s very little similarity between this process and that which occurs in a centrifugal separator. The last two ocean-going ships I was aboard, M/V Endeavour, a 295-foot ice-capable expedition cruise ship designed for high-latitude travel, and M/V Ever Renown, a nearly 1,000-foot-long containership, were both equipped with centrifugal separators, and with good reason. When you are at sea and cruising far from any port, independence is the order of the day. Centrifugal separators that are used for fuel and lube oil purification meet that standard because they require no filter elements to carry out their mission and because they are designed to operate continuously for months at a time. Centrifugal separators have many uses in industry and science for purifying and separating liquids such as cutting fluids used in machining, steam turbine lubricating oil, milk, wine, beer, fruit juice, and blood. The refining of biodiesel also has proven to be an ideal application for centrifugal separation, because it requires the separation of solids from a liquid, as well as the separation of liquids of differing densities. A few headlines pulled from the website of a company that specializes in on-site fluid purification using centrifugal separation make a convincing case for this approach: “Engine Manufacturer Saves $45,000,” “Water Glycol Recovery Saves Over $20,000,” “Fluid Control Saves $1 Million at Automotive Supplier,” “Metalworking Reclaim Saves $400,000 Annually.” It appears the firms that use centrifugal separation are aware of just how valuable and effective it can be. As seagoing trawler operators, diesel fuel is the fluid we’re most concerned about keeping clean, and centrifugal separators are ideally suited for this application as well. In addition to being a fuel, diesel is a lubricant. If diesel fuel didn’t possess the high level of slipperiness that is does, diesel engines as we know them simply wouldn’t exist. Highly stressed components through which diesel fuel passes once it reaches the engine, including the high-pressure injection or common-rail pump and the injectors, require lubrication, and it’s provided solely b y diesel fuel. If the fuel is contaminated with abrasive debris or water, it’s likely to cause rapid wear to these delicate and essential components, some of which are machined to tolerances measured in ten-thousandths of an inch. No operator of a diesel-powered vessel needs to be reminded of the problems that routinely occur when contaminants clog an engine’s fuel filters. Because of their “active” design, centrifugal separators are not well suited for a role in primary fuel filtration. However, they do work especially well as polishing system “purifiers.” (Again, it just doesn’t sound right to refer to these machines as “filters.”) They are used in polishing systems aboard the ships I mentioned earlier, as well as on a number of recreational trawlers. The Brazilian-built Buccaneer 65, a vessel I reviewed in PMM in September 2005, is equipped with an Alfa Laval separator. Centrifugal separator packages (separator, pump, and controller) aren’t much larger than a conventional polishing system kit. The aforementioned Alfa Laval MIB 303, which is what’s installed on the Buccaneer 65, displaces just under 2 cubic feet of engine room or engineering space, and it’s not the smallest unit offered. Power consumption is also quite reasonable; the MIB 303 draws a maximum of just 5.8 amps at 120VAC. Some units use a gearbox to allow a single electric motor to spin both the centrifuge and the fuel pump. In this case, the gear oil does require periodic replacement. What’s not to like about centrifugal separators? By now, you may have guessed: the price tag. These units require precise machining and robust construction, and that comes at a cost. The smallest Alfa Laval separator that would be suited for diesel fuel polishing, the MAB 102B, lists for about $8,500, while the unit mentioned above, the MIB 303, sells for $10,000 to $12,750, depending on the configuration. Thus, questions arise: Is it worth the expense? Is a centrifugal separator that much better, more effective, and less trouble than a conventional filter? I believe the answer to both questions may be yes, depending on your needs. Where filtration/separation technology is concerned, centrifuges often are considered the last word in removing dirt and water with the greatest reliability and the least amount of difficulty and equipment maintenance. If you have especially large fuel tanks, if you travel to locations where fuel may be of lower quality than usual, or if you simply want a bulletproof polishing system, then the centrifugal separator may be for you. It’s worth noting that because these systems are used primarily in commercial applications, such as ocean-going ships and power plants, they are especially long-lived and reliable. Many units are still in service after 30 or 50 years of operation. If you are prepared to pay for it, there’s little doubt that the centrifugal separator, perfected over a century ago and now used in a variety of industries, works exceptionally well in a fuel polishing role aboard cruising vessels. Steve owns and operates Steve D’Antonio Marine Consulting (stevedmarineconsulting.com), providing consulting services to boat buyers, owners, and the marine industry.